The Speaker Series is perfect for professional speakers, trainers, instructors and others frequently in front of an audience. 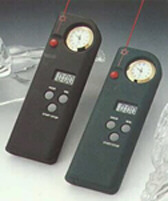 All models include an ascending and descending timer for creating and practicing presentations. The descending timer can be set before a presentation and beeps when five minutes remain. The Speaker Series are available with a durable black or green rubber coating and analog clock. Ascending and descending timer with descending alarm. Speaker Series models should not be dropped or exposed to temperatures above 110o F. (43o C.).